LinuxBarbados is for people who are passionate about Linux, open source, and building great things with software. We're based at the University of the West Indies (UWI) at Cave Hill, Barbados. We collaborate with RubyCaribe. 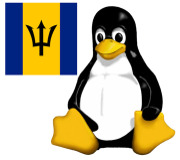 For information on our open source projects, visit the LinuxBarbados GitHub repo. For information on upcoming events, visit the LinuxBarbados Twitter feed. We look forward to meeting and collaborating with you! uwisession October 3, 2014 8:01 PM Ray H.
About LinuxBarbados April 21, 2014 4:31 PM Ray H.